People wade through a flooded street in the town of Baao in Camarines Sur province on December 30, 2018. In order to pinpoint the cause, we need to look to the Bible. Tropical depression Usman made landfall in the Philippines on December 29 in the Bicol region, killing more than 100 people and still counting, according to a January 7 government report. In a report by the National Disaster Risk Reduction and Management Council, 126 people were reported dead. In addition, 26 are still missing and 75 are injured. Most of the casualties were killed in their homes when heavy rain caused landslides, said Ricardo Jalad, executive director of the council. More than 682,000 people were affected in the aftermath of the storm. About 57,600 people are being cared for in storm shelters. The council estimated the agricultural and infrastructure cost of the storm’s damage at nearly $81 million. Most of the affected areas were flooded. In some areas, the water level reached the height of an adult. The authorities are still excavating the remains of the people from the landslide. In Camarines Sur, the flood is head-level. The diversion road going to Manila was broken and prevented people from traveling there. It took some of my friends 20 to 24 hours to travel from Bicol to Manila when it should only be 12 hours. I am a student, and classes were supposed to start today, but it got postponed because of the damage caused by the storm. 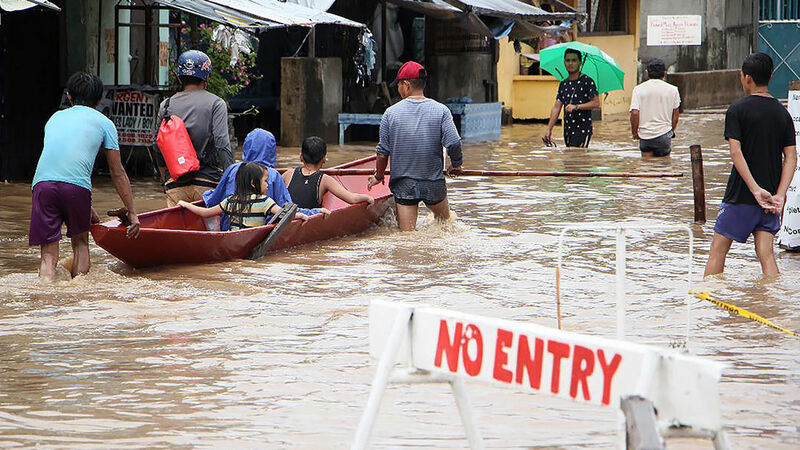 Storm Usman has already left the Philippines and has been downgraded to a low pressure system, but people who were affected still suffer from the aftermath. Those personally affected by the storm need answers. The God of the Bible claims that He controls the weather and natural phenomena! He says He causes the sun to rise on the evil and on the good, and sends rain on the just and on the unjust. He sends the snow and ice as well as drought and heat. The God of the Bible is omnipotent. He wields the punitive sword of flood and mildew—and also that of drought (Deuteronomy 28:22; 11:17). Sometimes He uses both at the same time in order to heighten their corrective power …. God causes these weather disasters! In one region God sends a drought—in another region, floods—and it all happens right before harvest time. Almighty God tells us that the real cause of our upset natural conditions is sin—which is the breaking of His laws (see 1 John 3:4). God uses weather to correct and discipline His creation—to help us realize the error in our ways! God’s ultimate purpose is to bring mankind back to Him. The weather is one of many ways God uses to correct our sins and bring us back to Him in obedience. “Natural” disasters, such as the storm and flooding in the Philippines, are the results of our sins and God bringing us back to Him in obedience. To understand more about this subject, please request your free copy of Why ‘Natural’ Disasters?